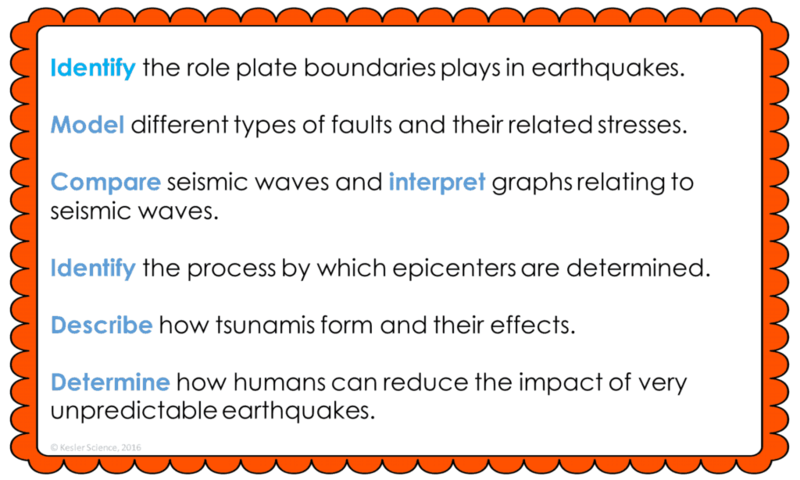 At the end of this earthquakes lesson plan, students will be able to identify the role plate boundaries play in earthquakes, model different types of faults and their related stresses, compare seismic waves and interpret graphs related to seismic waves, identify the process by which epicenters are determined, describe how tsunamis form and their effects, and determine how humans can reduce the impact of very unpredictable earthquakes. Each lesson is designed using the 5E method of instruction to ensure maximum comprehension by the students. 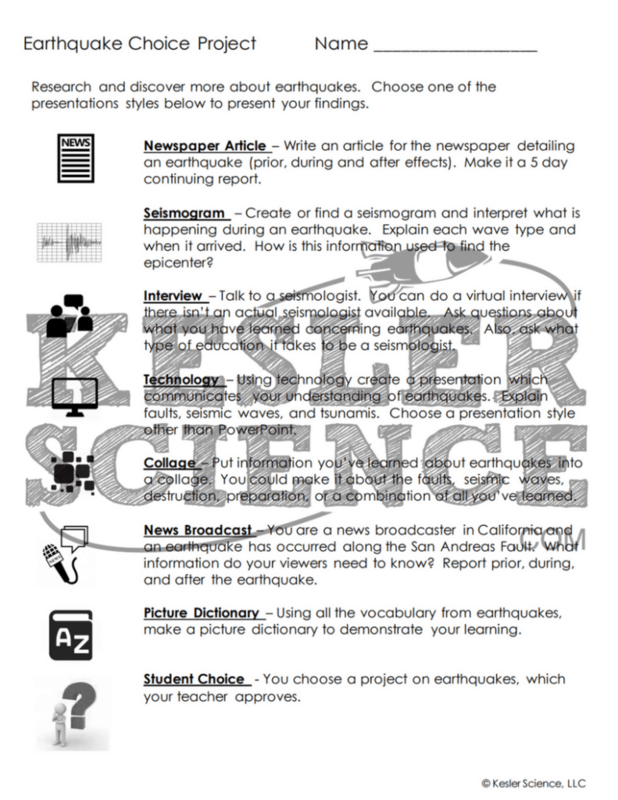 The following post will walk you through each of the steps and activities from the earthquakes lesson plan. Watch the video using the link provided. Discuss the word stress as a class. In what other context have they heard of this word? Tell them they are going to be learning about three types of stress that cause rocks to shift, which sometimes leads to an earthquake. Draw three simple diagrams using arrows of compression, tension, and shearing. 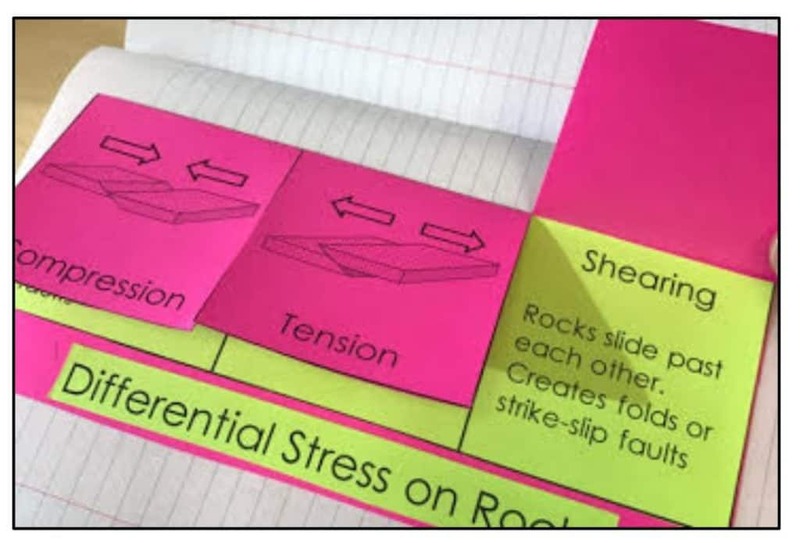 Based on prior knowledge ask students to match the three stress words: compression, tension, and shearing to the correct diagram. They can draw and write this in the INB or a piece of paper. Ask them to guess which type of stress is happening at the San Andreas Fault – (Shearing, which is called a Strike-Slip Fault). Help them make connections between these words and their action; ex. a tension headache might make you want to pull your hair out. Or let the kids stand up and model the movements. Explain that these are important terms in studying earthquakes. The teacher will help to clear up any misconceptions about the earthquakes. A major misconception students think is that earthquakes are likely to happen anywhere on Earth. This student-centered station lab is set up so students can begin to explore earthquakes. Four of the stations are considered input stations where students are learning new information about earthquakes and four of the stations are output stations where students will be demonstrating their mastery of the input stations. Each of the stations is differentiated to challenge students using a different learning style. You can read more about how I set up the station labs here. Students will be working in pairs to better understand how stress can cause the plates to move. 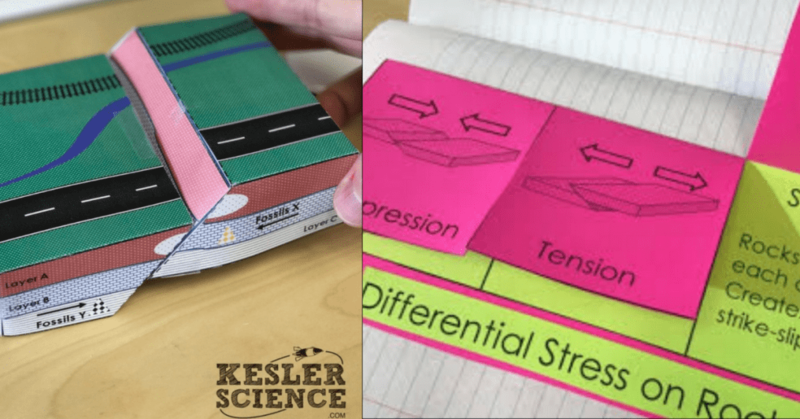 Students will be using a land model to show the three types of stresses, compression, tension, and shearing. Students will be using this model to make a few observations and to answer related questions listed on the task cards. At this station, students will be watching a short video explaining a brief introduction to earthquakes. Students will then answer some questions related to the video and record their answers on their lab station sheet. 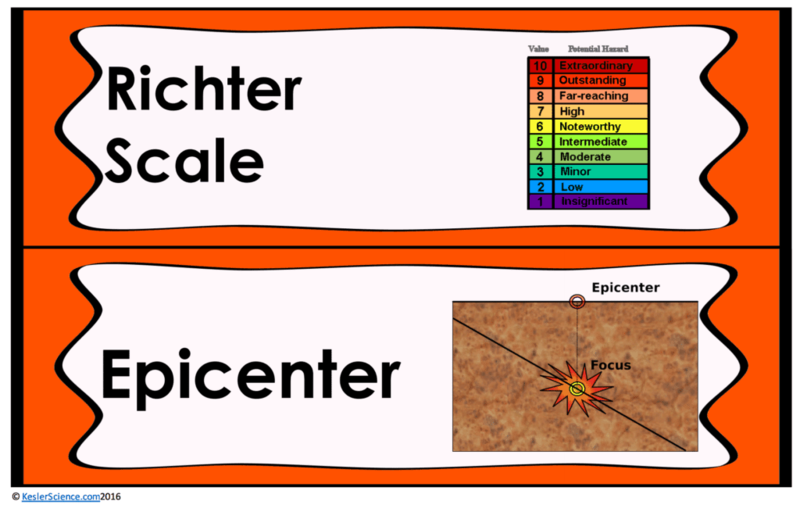 For example: Describe the difference between the epicenter and the focus of an earthquake. What causes earthquakes? Where do most earthquakes occur? Why do we sometimes have earthquakes away from plate boundaries? The research station will allow students to find out more information about earthquakes. While at this site, students will also be able to create a virtual earthquake in one of four given locations. Students will become seismologists and input data about S and P-waves, also where the epicenter would be located. This station will provide students with a one page reading about earthquakes. In the reading students will learn about seismology and the two types of waves that earthquakes produce, P-waves and S-waves. There are 4 follow-up questions that the students will answer to show reading comprehension of the subject. The assess it station is where students will go to prove mastery over the concepts they learned in the lab. The questions are set up in a standardized format with multiple choice answers. Some questions include: Where do earthquakes generally originate? What does the image represent? Which statement is incorrect about earthquakes? Where is the epicenter? Students who can answer open-ended questions about the lab truly understand the concepts that are being taught. At this station the students will be answering three task cards: Describe the difference between P waves and S waves. How do scientists use data to determine the epicenter of an earthquake? 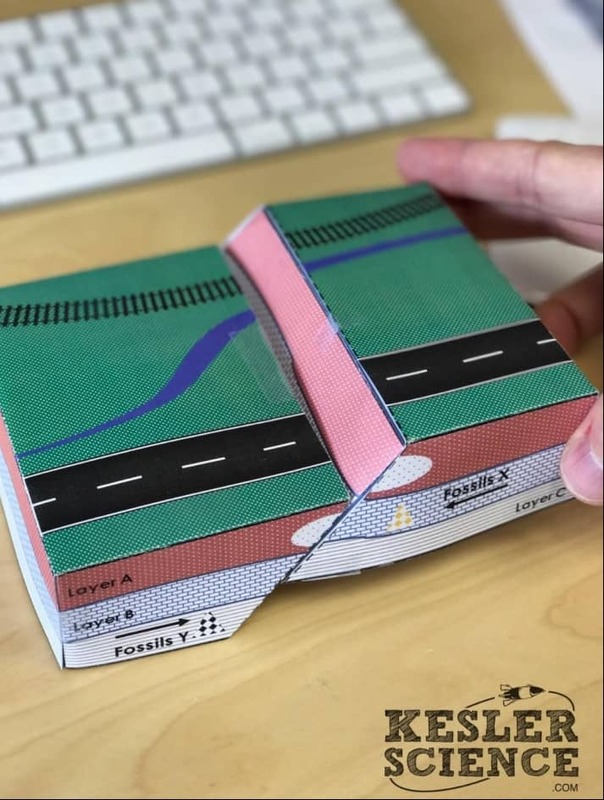 How are plate boundaries and faults related to earthquakes? Your visual students will love this station. 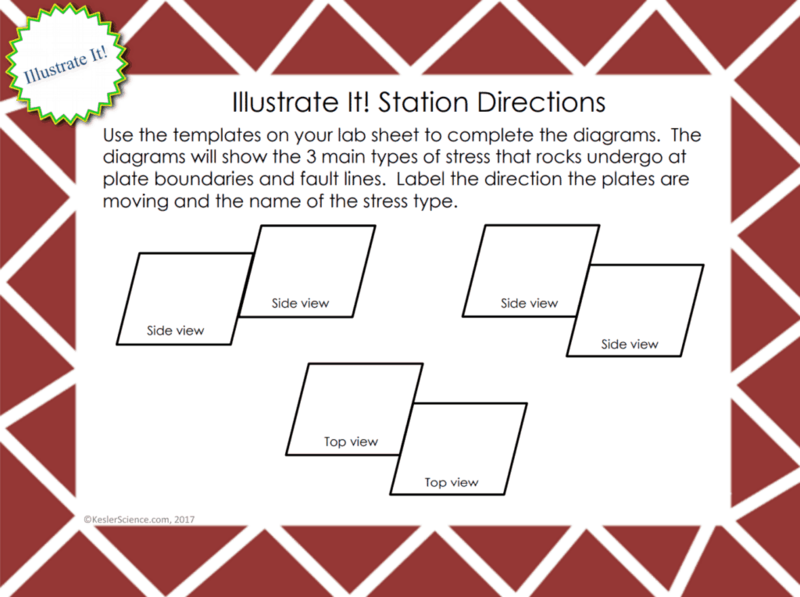 Students will label three diagrams with missing information about the three main types of stresses that rocks undergo at plate boundaries. The organize it station allows your students to organize key vocabulary terms with the correct definition. This will allow the teacher to see if the students understand terms related to earthquakes. The explanation activities will become much more engaging for the class once they have completed the exploration station lab. 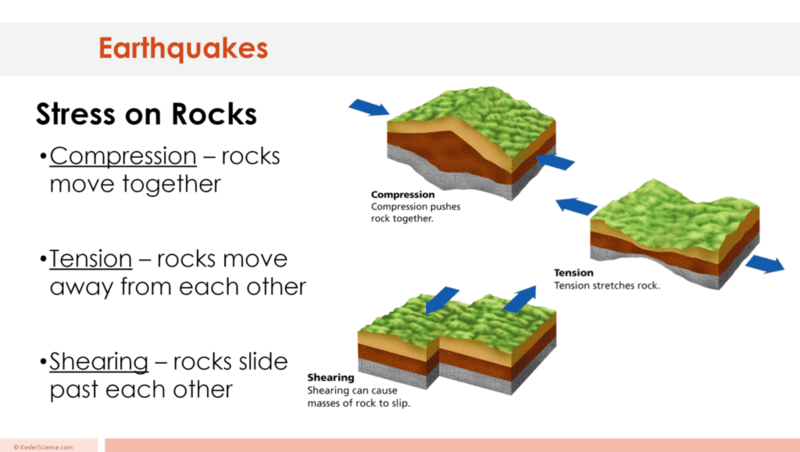 During the explanation piece, the teacher will be clearing up any misconceptions about earthquakes with an interactive PowerPoint, anchor charts, and interactive notebook activities. 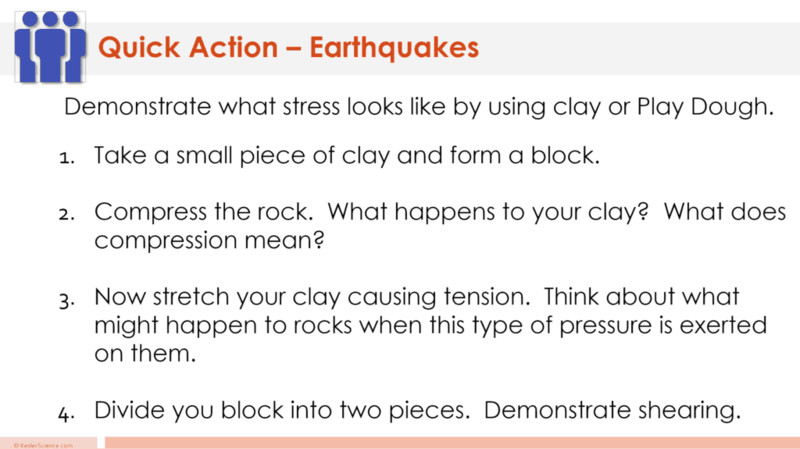 The earthquakes lesson includes a PowerPoint with activities scattered throughout to keep the students engaged.